Tiny Yellow House is the creation of Derek "Deek" Diedricksen of RelaxShacks.com. 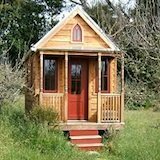 It's an online TV show on tiny houses, simple living, and building your own small structures. This page will feature some of Deek's past and latest episodes. He's a funny and entertaining guy who is always up to interesting things so I think you'll really enjoy watching his episodes. On episode one he shows you his "Hickshaw" cabin which is an extremely small (andp ortable) structure. It's 7 feet long and roughly about 5 and a half feet tall. 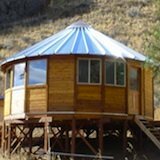 This is made to be used for a variety of purposes like sleeping/camping for one, storage, reading, relaxing, a green house, sauna, micro shed, or whatever else you can think of. 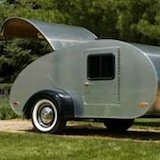 The Gypsy Junker is made out of about 90% recycled materials and resembles a gypsy wagon (sort of). The inside is just 24 square feet so it's pretty much just a camper but it's actually possible to sleep three in it. On this episode brought to you by Make Magazine Deek shows you his latest Box Lady which is a "micro" cabin intended to be used for camping, the homeless, and for retail. Here, just check it out--it's a fun episode. In this episode Derek and his brother Dustin head over ot northern Vermont to a tiny cabin that they built together. They bought the land in 2000 and have been working on the project ever since. No power tools (for the most part), no running water, plywood exterior, and they're working on an addition. Lots of salvaged materials were used in the making of it... Anyway, I'll let them show you! 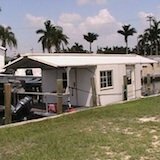 For more on Tiny Yellow House and Derek "Deek" Diedricksen visit him at RelaxShacks.com. Stay tuned for more of his fun episodes.